Alphabet Glue: An E-Magazine for Families. 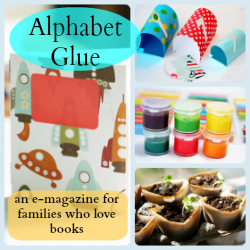 Welcome to the home of Alphabet Glue, a downloadable magazine for families who love books! Filled with activities, printables, projects and plenty of inspiration, Alphabet Glue was created in hopes of helping more families to incorporate creativity, imagination and all things literary into their everyday routines. Click on any or all of the buttons below to learn about each issue of Alphabet Glue and all of the crafty, bookish goodness that you can expect to find inside!